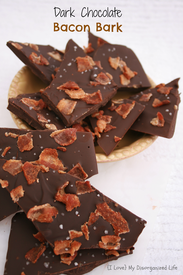 Dark chocolate bacon bark with sea salt! Can we talk chocolate for a moment? I have been a lover of this magical ingredient for decades. It goes with nearly everything! Including bacon?!? At least, that’s what my initial reaction was. But yes, it really does! And it is so incredibly good. And salt. Let’s not forget the other half of this sweet and salty equation. And yes, I do realize that bacon has enough on it’s own, but a little more is really a good thing here! This is super easy to make, and super hard to resist!